Head over and join in on the fun! 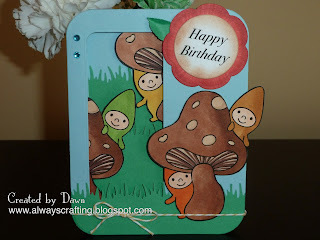 I used a digital stamp, called Bibis on Mushroom, from Pink Cat Studio. You can check out this digi stamp here. This card has three layers to give it a 3D effect. 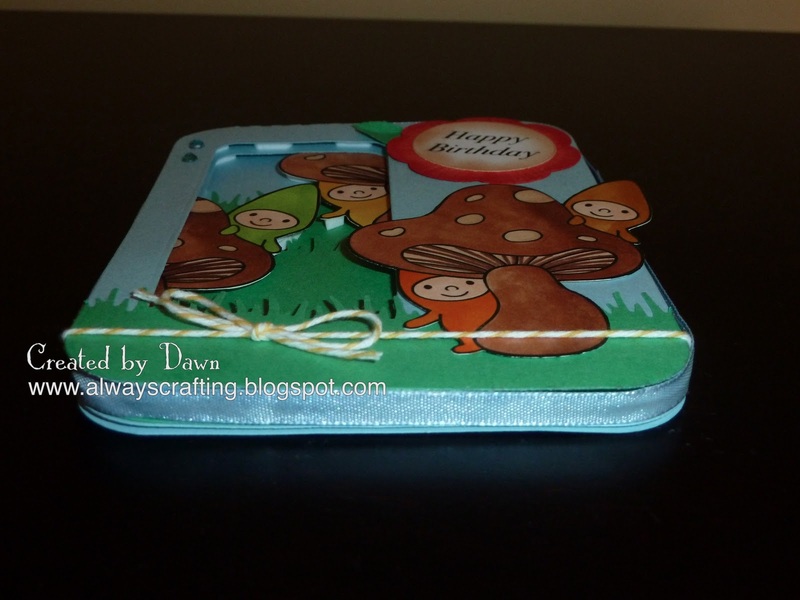 I used Lifestyle Craft dies from the Special Delivery set to make the card base, layers and windows for this 3D card. I cut a window into two of the layers. 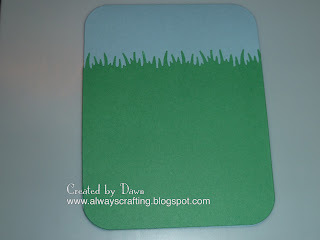 The first layer is the back drop so I added grass using a Martha Stewart punch. 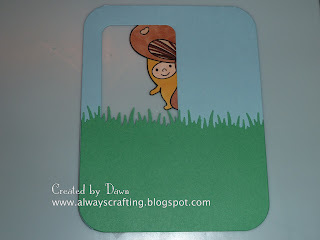 This layer is the card base so it is hinged with a back and front. The inside will be decorated too. The second layer has a window cut into it. Plus I added grass again using the Martha Stewart punch and half of the Pink Cat Studio digital stamp peaking through the window. The third layer also has a window cut into it. Grass was added again from a Martha Stewart punch and the other half of the Pink Cat Studio digital stamp. Can't waste a great stamp! LOL This is the top layer so once all the layers are put together using pop up dots more will be added to this layer to finish the card. Here is a side view of the finished card. 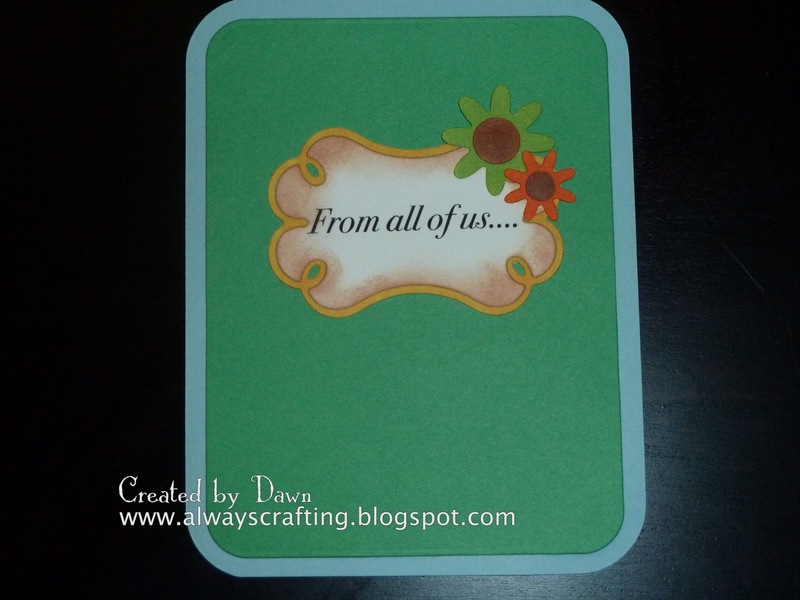 You can see it is a thick card and the layers have been put together using the pop up dots. The full stamp from Pink Cat Studio is placed on the top layer along with sentiment, some lemon Divine Twine and some blue rhinestones. 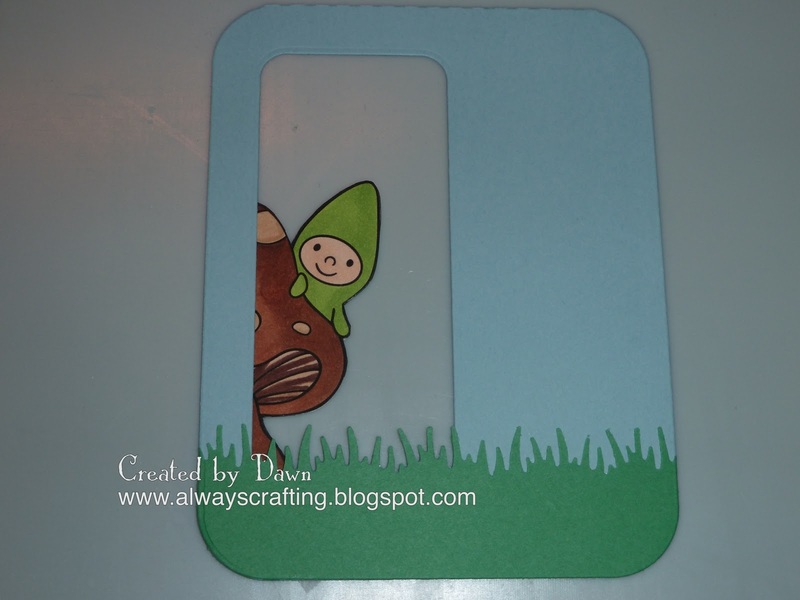 I used ribbon around the outside to finish of the card and to hide all the pop up dots. 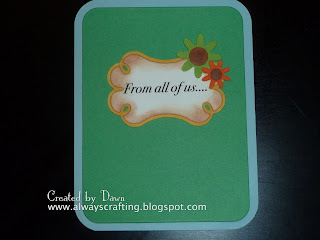 The inside of this card is decorated also with more dies from Lifestyle Crafts and more sentiment. Update: this card was featured on Birthday Sundaes Challenge. 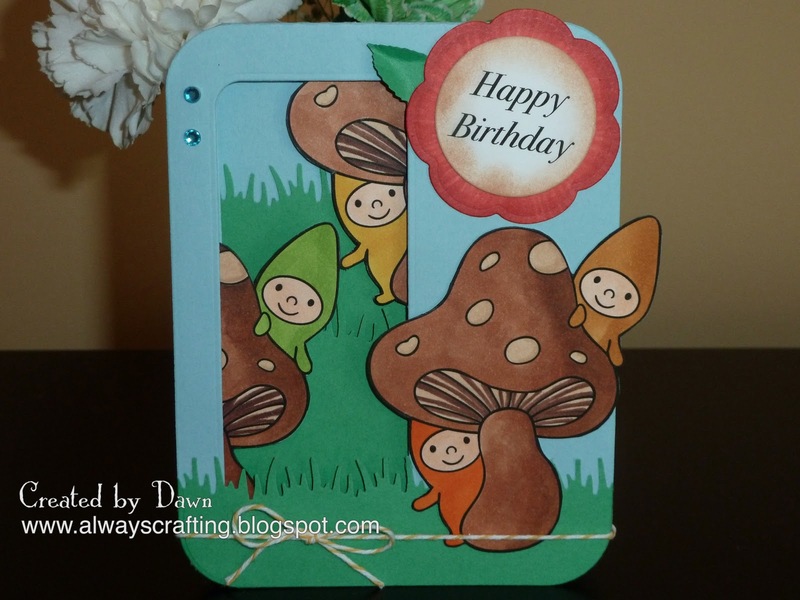 I also made a card using Doodle Pantry stamps and Doodle Pantry Digital paper. I have never used Digital Paper before but I have to tell you the papers are really a cool thing to use. 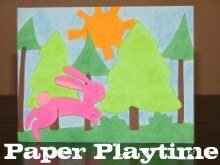 You won't run out of paper in the middle of a project. You can just print more. Love that! You can get the Watermelon Lunch stamp, "Wanna have lunch" sentiment and Watermelon digital paper here. Two beautiful cards. You did well with the 3d effect. Great images and perfect digi papers. Thanks for joining EAC twice this week. 2 great cards, love both of them! Thank you for joining us at Creative card crew this week! 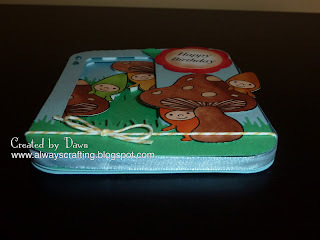 Both are cute projects, but I seriously love that mushroom card! 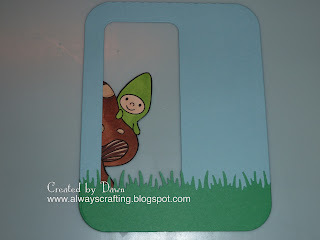 What a great way to use layers! Thanks for playing at FFF! Cute cards you have made, you made me laugh. Great layering. Thank you for sharing with us at FFF. WOW!!! They are both great cards but that 3D card is absolutely amazing! I love those images...they are adorable! Thank you for entering it into our Spring Birthday Challenge at Birthday Sundaes! Wow, such cute, cute cards! I love 'shrooms' lol. Cute images and both are really great cards. Very cute birthday card! Great design! Thanks for playing with Birthday Sundaes! 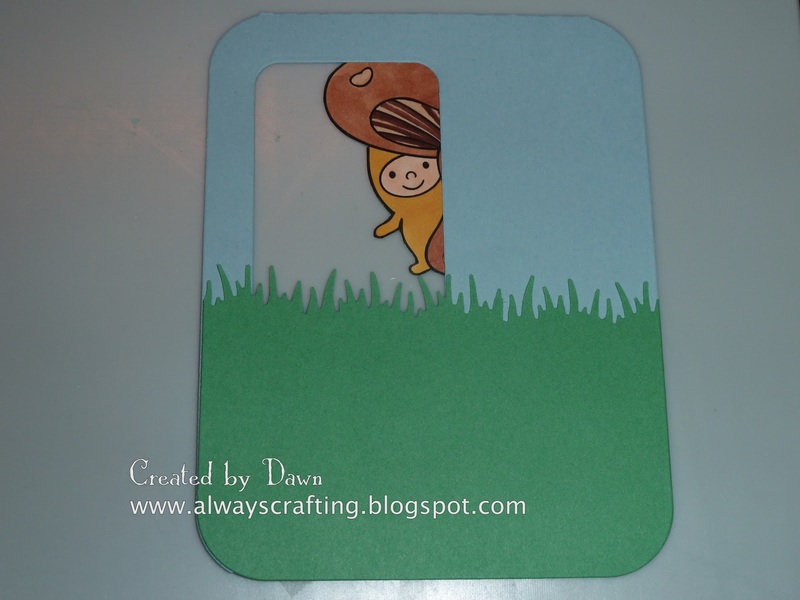 love these digi monday creations Dawn! 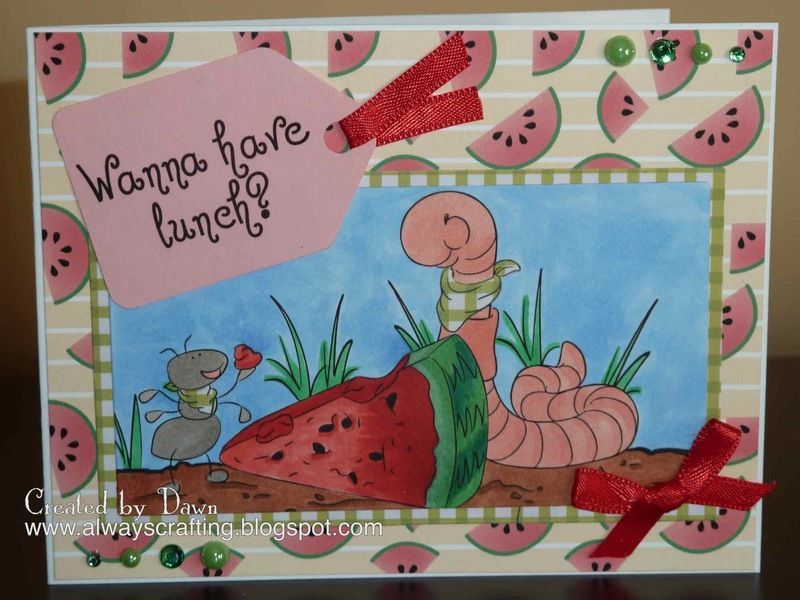 brilliant 3D project with this cute PCS image and super adorable DP card...makes me hungry for watermelon!